Five years ago this month I was fortunate enough to attend a screening of “Hoosiers” (1986), the mostly beloved basketball movie, at my then-neighborhood’s Music Box theater. It was followed by a discussion and Q&A hosted by the Chicago Tribune’s film critic, Michael Phillips, and sports columnist, David Haugh. The featured guest was Chelcie Ross, who played George Walker, principal “Hoosiers” antagonist. Ross is a true That Guy – “Hey! That guy!” Seriously, scan his IMDb credits and you will know almost all the movies even if you don’t straight away remember him in them, though if you give it a little thought, his face and who he played will start to come back to you. He’s a character actor if there ever was one, and one who has excelled equally at the movies, on the stage, and in TV. He’s been everywhere, man. In the Q&A, Ross could not have been warmer, which I found funny because in “Hoosiers” he is often so cold. You see it when George is running a basketball practice for little Hickory High that new coach Norman Dale (Gene Hackman) politely, yet insistently, commandeers. That leads to George making a thinly veiled threat, and as he does so, Ross truly evinces a small town guy who dislikes change, which is one of the currents undulating just below the heartwarming underdog story. You see this dislike even more acutely in a scene finding Norm summoned to the town’s barbershop where all the local men gather to grill the new Coach, even the man of cloth, who very seriously queries about Dale’s preferred on-court defense. Throughout this, George sits in the barber’s chair, which may as well be the small town throne, putting him on a pedestal above the coach, which Ross plays to the sneering hilt. 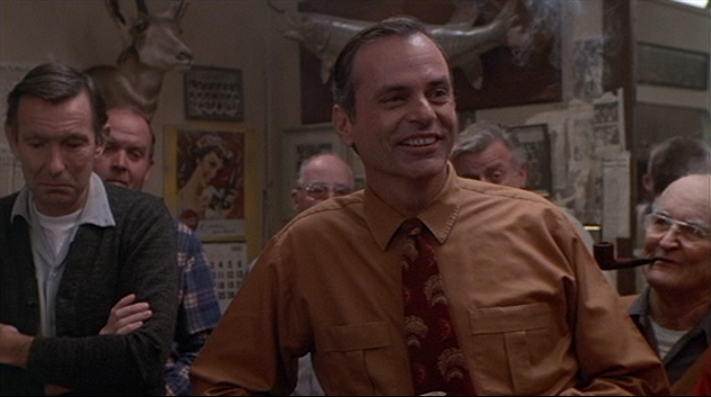 Behind the scenes, George gradually engineers it so that Coach Dale, whose team finds little success with star player Jimmy Chitwood refusing to play, is on the verge of being run out of town, brought to a head at a town meeting where a vote is set to be taken to decide Norm’s stay or go fate. But that meeting is where the fabled Jimmy Chitwood turns up to say he’ll play, but only if Coach Dale stays, which naturally means Coach Dale will stay no matter what. And when George realizes this, Ross is given one shot to make it count, which he does by assuming an expression of a man who just ate some bad fish. From there, Hickory High start its march to the championship game, and because it does, George takes a backseat, though he fails to completely fall out of the picture. He is still occasionally glimpsed, and as he is, both Ross and director David Anspaugh continue slyly cultivating the character’s arc. Because if initially every time we see George in the crowd, he is peeved or looking Americana Machiavellian, his demeanor noticeably brightens. 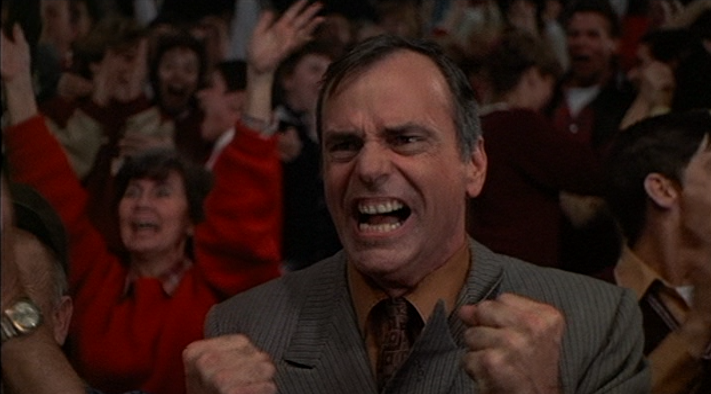 When hapless assistant coach Shooter (Dennis Hopper) briefly takes the team’s reigns and runs the picket fence to improbably win a last second game, the camera catches sight of George patting Shooter on the back whereas in earlier moments George could hardly stand to breathe the same air as the trying-to-stay-sober drunk. Winning cures all ills, they say, and George proves it, because as Hickory becomes an unstoppable basketballing force, all George’s objections with Coach Dale fall by the wayside. Has there ever been a more succinct image of the lunacy that winning engenders? That is not merely a man espousing joy over the positive outcome achieved by a few good-hearted, hard-working teenagers; that’s a man unleashing psychotic relief over mastery of the terrible alternative. And all us sports fans have been there, don’t try and deny it. That, like it or not, admit it or don’t, is the face of winning. 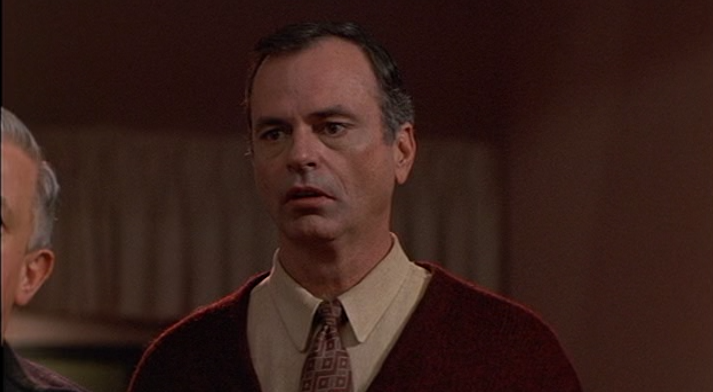 At the Q&A, Ross mentioned that his character was supposed to be the father of one of the team’s players, gum-chewing, defensive specialist Buddy, though, as Ross pointed out, in the editing room, that connection entirely fell away. And this editing decision was right. By having no personal attachments to the team, the team was his all he had, meaning he funneled his self-worth entirely through their wins and losses. 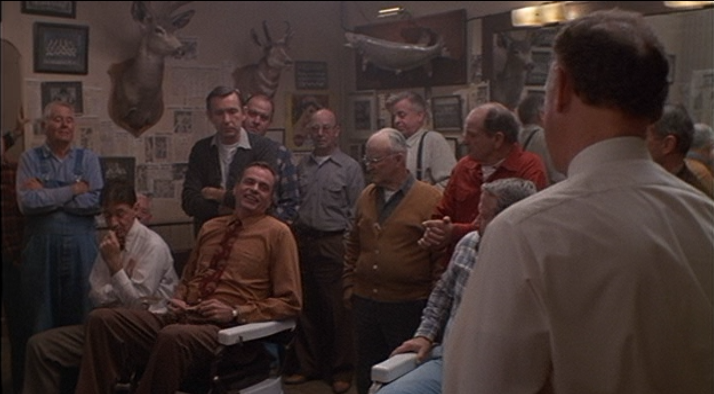 There was no “Hoosiers” sequel, of course, and we don’t know if Coach Dale stayed on or if he moved away, though in the last scene, all we see is one framed Championship Team photo, not two, meaning there was no repeat. I wonder if the team’s record fell off. I wonder what George looked like then.